Alan Stubbs says his comments were "blow out of proportion"
Hibernian manager Alan Stubbs insists there's no spat between himself and Rangers counterpart Mark Warburton. Stubbs was reported to have said managing is easy when there is lots of money available to spend. Warburton had responded by saying rival managers should concentrate on their own club. But Stubbs feels his comments were "blown out of all proportion" and added: "I said it's easier when you do have funds available." He explained: "I think there's been a bit of mischievous journalism, which has played a part in it. It's not a spat. "No job in football is easy, in managing. "Mark's done a great job since he came in and he's brought in some very good players." Hibs visit Rangers in Sunday's Scottish Championship match, and Stubbs said: "I'll shake hands with him (Warburton) before the game. I'll see him after the game, where I'm hoping he's going to be giving me a drink - and that's not alcoholic - and then we'll have a chat. "I've got no problem whatsoever, Mark knows that. We've had conversations before." Sunday will be the second meeting of the sides this season after Rangers beat Hibs 6-2 in July's Challenge Cup tie. "We learned a lot from that game and this match is our priority because it's a league game," Stubbs said. "It's going to be a great game no matter what. You've got two teams who have got aspirations to do really well this season and try and win the league. "And if someone can try and throw a few irons into the fire to try and stir things up, that's what you've seen over the last couple of days. "The game certainly doesn't need added spice because it's going to be a good game anyway." 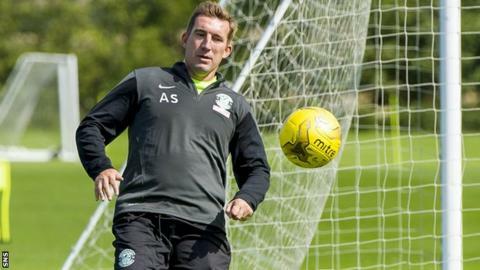 Stubbs would like to bring in some new players before the transfer window closes on 31 August but does not feel he needs to. Dylan McGeouch, who spent last season on loan at Hibs from Celtic, has been linked with a return to Easter Road. "Anyone would like to strengthen when they have an opportunity to and I'm no different," Stubbs said. "We're always looking for ways to make us stronger on the pitch and we will be actively trying to do that."